The rain did not stop our plans this morning! We went to Wild Earth Cafe for some yummy breakfast and coffee. As you can see, we wore our boyfriend jeans and blazers. On Jasmine: Blazer: Club Monaco / Jeans: The Gap / Tank: Vince / Shoes: Coach / Headband: Club Monaco / Watch: Marc by Marc Jacobs / Necklace: American Eagle / Bag: Zara. On Kaila: Bold Shoulder Blazer: Club Monaco / T-shirt: Marc by Marc Jacobs / Jeans: Current Elliott / Bracelet: Giles & Brother / Shoes: Browns. L-O-V-E those shoes in photo two. The blaser in the first photo is lovely. You both have nice outerwear, love the outfits. Discovered your blog through Jak & Jil (handy!). Looks really cool. I'm quite jealous of your new Stella dress and your holiday shopping. 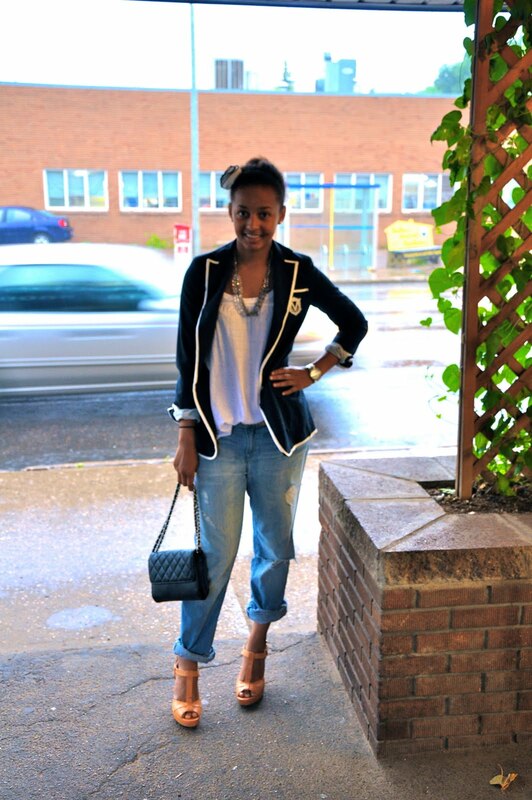 You look tres chic in the blazers & jeans. For sure I'll be visiting c'est classique again. Merci for the inspiration! Oh My, You Guys Look Refreshingly Chic. Loving their style.. very cute..